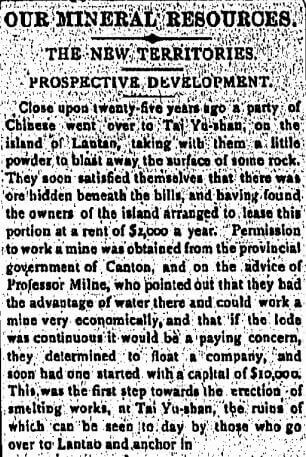 Tymon Mellor’s article, Mui Wo Silver Mine – Part One – The Owner provides much information about Ho A Mei who promoted and developed the mine that lent its name to the well known Silver Mine Bay on Lantau island. 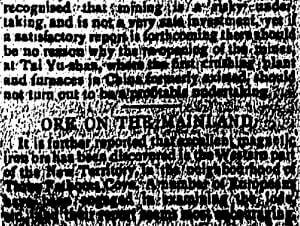 Tymon has sent this Hong Kong Telegraph article published in 1905 which provides guidance on the plant and a plan to re-open the mine. Many thanks to Mark Regan and John Smith for typing out the article and valiantly attempting to interpret the last couple of paragraphs. From the mines to the shore where the works were located the ore was taken in buckets running on an endless wire rope, while the crushing process was carried out in a large building the roof and walls of which were entirely made of galvanised iron. A fifty-horse power engine and boiler gave motion to a stone-breaker, three pairs of crushing rollers, eight jiggers and two buddles, being placed on the top floor; while in the lower part of the works were a thirty-horse power boiler which set in motion a twelve-horse power engine driving four fruevanners, a six-horse power engine working a lift to the top of the mill, a 3,000 feet long wire rope tramway to the mines, and another six-horse power engine for driving the blasts of the furnaces. In the furnace house were eight furnaces of various types, all connected by flues and a condenser to a chimney sixty-feet high, standing on the hillside about a hundred feet above their level. A hydraulic motor was driven by water from a twelve-inch main of iron pipes 2,000 feet up the mountain side where a dam for collecting the water had been constructed. These were the works which a visitor to Tai Yu-shan would have found at Silver Mine Bay some fifteen years ago. The soft hand of Nature has now laid her cloak of green around the remains, the walls have long since crumbled away, and only the cemented floor is observed near the beach where it serves the peasants from the dwellings close by as a drying ground for rice and fish. On the neighbouring hillside stands the chimney, commanding an excellent view of the entrance to the mine, with tons of excavated earth banked up from the running stream some fifty feet below. recognised that mining is a risky undertaking and is not a very safe investment, yet if a satisfactory report is forthcoming there should be no reason why the re-opening of the mines at Tai Yu-shan, where the first crushing plant and furnaces in China formerly existed, should not turn out to be a profitable undertaking. It is further reported that excellent magnetic iron ore has been discovered in the Western part of the New Territory, in the neighbourhood of Thirty Fathoms Cove. A number of Europeans have been engaged in examining the lode etc. and their report seems most encouraging. The contemporary image shown on the Home Page of this article is of the Lower Tunnel at the mine. This article was first posted on 12th June 2017.